If you dream of permanently straightening your teeth, but balk at the thought of bands, brackets, and wires, OC Lifesmiles offers an appealing alternative: Invisalign® clear aligners. Invisalign® is an orthodontic innovation which can comfortably and discreetly align the teeth and bite. Cosmetic dentist John Cross, DDS works very closely with skilled orthodontists to both plan your treatment and monitor your progress. If you’d like to learn more about Invisalign®, also known as “clear braces,” contact our practice today. 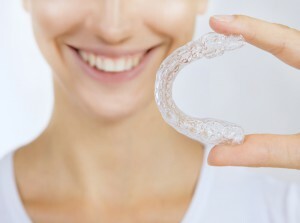 Meant to correct problems like overbites, underbites, crossbites, crowding, and unevenly spaced teeth, Invisalign® uses a series of removable, plastic aligners to gently shift teeth into place. The patient will wear one set of aligners for about two weeks, and then switch to the next set in the series. Each set of aligners is modified to allow for a gradual repositioning of the teeth until optimal results are achieved. When compared to traditional braces, Invisalign® offers both adults and teens a way to improve common orthodontic concerns in a much less noticeable way. 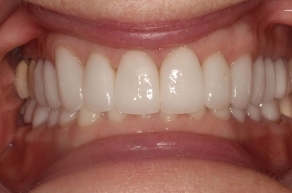 The aligners are virtually invisible. Most people won’t be able to tell that you are even wearing them! Your aligners are custom-created specifically for your teeth and bite, so you can achieve maximum results in a short amount of time. Treatment is convenient, since you can remove the aligners at any time. Although the orthodontists we work with don’t recommend leaving your aligners out for too long, removing them for meals, cleaning, and special occasions is not a problem. Since they are removable, it’s easy for patients to thoroughly brush and floss, which is crucial to preventing cavities and gum disease. 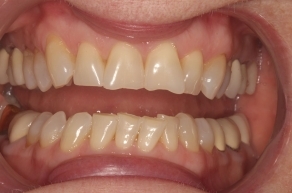 The length of treatment is significantly shorter than that of traditional metal braces. 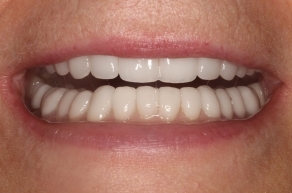 Some of our Invisalign® patients from Orange County achieve their desired results after only six months – although this is not typical for everyone. There are a number of distinctions between Invisalign® and traditional braces. While both offer effective ways to correct common orthodontic concerns, Invisalign® is designed to provide patients with an altogether different treatment experience. The brackets and wires that compose braces can successfully improve the positioning of the teeth, but can also uncomfortably press into soft oral tissues. Invisalign® relies on clear, plastic aligners rather than wires and brackets to achieve optimal results. Plus, while braces often come in clear or ceramic varieties to minimize their visibility, the fact is that they are often still noticeable. Invisalign® aligners are so clear that it is unlikely others will see them, even when you are showing off your biggest smile. In addition, when compared to braces, Invisalign® often takes much less time to achieve successful outcomes. For patients who have more severe or complex orthodontic problems, traditional braces may be the better alternative. However, Invisalign® has been successfully utilized as a primary orthodontic treatment for many individuals, and it has proven to be effective for a wide array of concerns. Our dentist will be happy to evaluate your needs and talk with you about the option that can best fulfill your goals. Once you arrive for your initial consultation, our dentist will perform an oral evaluation and talk with you about your options. If Invisalign® can help you meet your needs, Dr. Cross will create a customized treatment plan designed renew your smile with beautiful results! What Does the Invisalign® Treatment Process Involve? The Invisalign® treatment process starts with an examination and impressions of your teeth and bite. An advanced 3D computer imaging system will design a treatment plan as well as a series of aligners for you to wear during treatment. You will wear each set for two weeks at a time before switching to the next. Based on the advice of trusted orthodontists, you should wear your aligners for 20 to 22 hours per day, removing them to eat, drink, and clean your teeth/gums. Your teeth should move, slowly but consistently, into the correct alignment, eliminating gaps and spaces. We can provide more information and answer your questions about the Invisalign® clear braces technique when you visit our practice. Please don’t hesitate to contact us to set up an appointment. To help expedite your orthodontic treatment, a device called AcceleDent® can be used. While your prescribed Invisalign® clear aligner is in place, simply fit the AcceleDent® mouthpiece around the orthodontic appliance, bite down gently, and activate the device. The AcceleDent® uses gentle vibrations called SoftPulse™ technology to help accelerate the gradual tooth movement caused by Invisalign®. 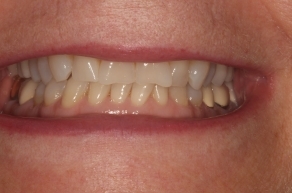 Many patients have achieved straighter teeth up to 50% faster than they would have without the device. To reduce your orthodontic treatment time, AcceleDent® should be used for 20 minutes every day, in conjunction with your Invisalign® treatment. The length of treatment necessary for Invisalign® to yield the best results ultimately depends on each individual’s orthodontic needs and goals. With that in mind, many patients are able to complete the treatment in 9 to 15 months. To ensure that optimal results are achieved as quickly as possible, it is important to wear the aligners as often as directed. The total cost of Invisalign® varies among patients. Since the treatment plan is customized, factors such as the complexity of the orthodontic concerns being addressed, the number of aligners required to achieve the best outcome, and other components will be taken into account. The manufacturer of Invisalign® has estimated the average price of the treatment to be in the neighborhood of $3000-$8000; however, it’s important to remember that this is a very broad range and will ultimately depend on the individual treatment plan. It should also be noted that many insurance plans offer partial coverage for orthodontic procedures. A member of our dental team will produce a total cost estimate once your Invisalign® treatment program is developed. They will go over all of your options and answer any questions you may have about insurance or the many payment methods we accept here at OC Lifesmiles. If you are interested in paying for your procedure over time, our office works with CareCredit®, a reputable dental financing company that offers an array of convenient monthly payment plans for qualified applicants. If you are considering Invisalign® “clear braces” treatment, please contact OC Lifesmiles today to set up a consultation. We look forward to helping you renew your smile!